Sweet Sadie's Baking: Christmas Stollen - My Daring Baker's Challenge! Christmas Stollen - My Daring Baker's Challenge! This month I have the honour of hosting the Daring Baker’s Challenge and I chose Stollen. 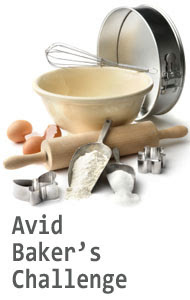 I was so excited and very nervous when I was deciding on my recipe…would the Daring Bakers like it? Find it challenging enough? And so on. I think my friends thought it was all I wanted to talk about ...I drove them crazy....thank you for putting up with me! Monika is the sister of my friend and colleague Melanie, and she sent me her Stollen recipe, a German tradition in their household. I tweaked it and then Audax, my Daring Baker friend (DBF!) in Australia, helped me test it and we tweaked it more. We added lots of hints and even made our own candied peels as well as changing the shape into a wreath –so we didn’t stay totally with tradition..... but the results have been unbelievable with most DB's thrilled! 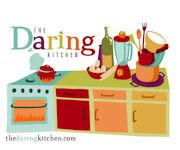 Thank you Liz of La Mia Cucina and Ivonne for your hard work with the Daring Bakers and thanks Audax for all your help and always being there – not only with hints about the recipes but reminding me that it should always be fun! The 2010 December Daring Bakers’ challenge was hosted by Penny of Sweet Sadie’s Baking. She chose to challenge Daring Bakers’ to make Stollen. She adapted a friend’s family recipe and combined it with information from friends, techniques from Peter Reinhart’s book.........and a Martha Stewart demonstration. Stollen is a bread-like fruitcake made with yeast, water and flour, and usually with zest added to the dough. Candied orange peel and candied citrus are often also added. Over the centuries, the cake changed from being a simple, fairly tasteless "bread" to a sweeter cakelike bread with richer ingredients. The Advent season was a time of fasting, and bakers were not allowed to use butter, only oil, and the cake was tasteless and hard, but this has changed and we definitely use butter! You can watch this little video from Martha Stewart where she demonstrated (along with her mother) a stollen in a wreath design. Click here for the printable recipe! For more bread recipes and info, check out Yeastspotting. I wish you all a very happy holiday season and a healthy and joyful New Year! Big Christmas hugs to all! Thanks for being such a great challenge host and for such a great recipe! Your stollen is beautiful. Happy Holidays! Hi Penny! Thank you for hosting this great challenge. Your wreath is lovely and so festive:) I really enjoyed making my Christmas Stollen and my family loved it! Merry Christmas! I will look for you on Twitter. Thanks Penny. I LOVED the challenge and I appreciate all the work you put into it. Happy Christmas to you. Thanks Penny for the very nice challenge. I liked it so much that made it three times. Happy Holidays! This challenge was a lot of fun! I wound up making two different versions, and will be keeping this recipe in mind for future use, too... Not bad for a girl who celebrates Hannukah! Thank you so much!!! You are the daring-est baker I know. I'm proud of you baby. Merry Hannukah! Mazal-tov on the Christmas bread. Looks fabulous! This was a great challenge, the first one in at least a year that really got my creativity wheels spinning. Thanks for wrangling all of us, it is so much work!! Merry Christmas to you penny. Thank you for hosting the delicious challenge. I loved it, and also loved the stollen pudding that the wreath found itself in. Your wreath looks festive and delicious! Happy Hoildays! You have such wonderful enthusiasm and you produced a beautiful stollen. Bet you made a lot of people happy with the fab recipe. Thanks for choosing that challenge! I really loved it. Your stollen wreath is beautiful and has such a lovely texture. Thanks so much for the fabulous challenge, Penny! I'd never have thought to make stollen otherwise, but it was such a lovely thing to bake and, of course, to eat! I'll definitely be making one again next year. Your wreath looks absolutely gorgeous - the texture is to die for. Thanks again for being such a great host and I hope you enjoy the rest of the festive season. Merry Christmas and a Happy New Year! Thank you so much for hosting this month's challenge. I'm not a fan of fruit cake, but the stollen turned out wonderfully and I'll probably be baking it next year too. Your stollen wreath looks wonderful! Your final crumb for your stollen is excellent well done. Penny, thank you so much for this challenge. I learned all about Stollen and I LOVED the end result. Unfortunately there were no leftovers to make "rabanadas" (Brazilian French Toast)... Everyone loved it! Penny, thank you for the wonderful challenge - it could not have been any more perfect! The Stollen was absolutely delicious Penny, thanks for a wonderful tasty challenge! Thank you for being our hostess this month. You put a lot of effort into making this an easy to do this challenge. Thank you so much for this challenge. I know I'll make this recipe for years to come! I just want to thank you for this great challenge! I'm sure I'll make this recipe every year! Certainly it'll become a tradition in my home! thank you for such a fun challenge, I will be making this next year!! Hi Penny!! The stollen sounds delish, I have just mixed the dough and refrigerated it. Could you please help me with this query? Once out of the fridge, how should the dough look like after 2 hours at room temp? Or is it 2 hours for any kind of weather conditions? Please help! !